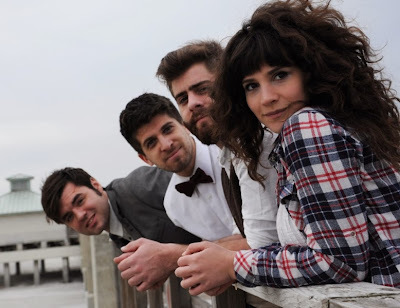 Brooklyn based indie folk rockers Swear and Shake will be kicking off their fall tour next Thursday, October 10 in New York. They'll be taking the stage at Drom. Full show details are below as well as a list of tour dates. Go show them some love when they're near you or heck, take a road-trip and show them some love. Swear and Shake is fronted by the guitar wielding Kari Spieler and the guitar and banjo playing Adam McHeffey, the two expertly blend their vocals, melodies, and confessional lyrics. Rounding out the quartet are old friends Ben Goldstein on drums and Shaun Savage on bass guitar. The group released their debut LP, Maple Ridge, in 2012 and have their sophomore album set for release in 2014 (date tba). You can check out the video for "Brother" over at Diffuser.fm.